Pacific Model Warship Club is a Radio Controlled (R/C) model ship club in association with Queens Own Warship Club. Founding members have participated in this hobby for over 30 years and in several scale formats. 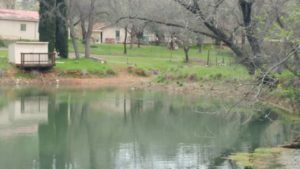 Primarily, we operate in Auburn, California. PMWC members mostly live in and around Northern California, but several regularly participating members live as far away as Portland Oregon and Reno Nevada. 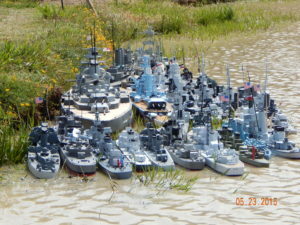 We build 1:72 scale model warships and auxiliary vessels constructed from hobby balsa wood and other materials commonly found in hobby stores or the local Home Depot. To build our ships we start with a set of plans and scratch build everything from there. Sound daunting, don’t know how to build? No need to worry, because we will teach you how or in some cases an already complete ship can be purchased. Let us ease you into this exciting hobby with more facets than diamonds. And of course the best part, our ships pneumatically fire ball bearings at each other. Yes, they can and do sink. This part of the hobby can be a nail biter. So, if you enjoy modeling, strategizing and a whole lot of adrenaline, this hobby is for you. We are recruiting! All you need is the interest and we will help you with the rest. Go to our Contacts Page where you will find staff members eager to answer your questions and help get you started.